As a freshman at Northern Arizona University, Isabel Rojas has mixed feelings about her new surroundings. “There have been happy and sad moments being away from home for the first time.” Technology has helped with this transition, and she uses FaceTime to stay connected to family and friends. She also sees the bright side of choosing to go to school a couple hours away. 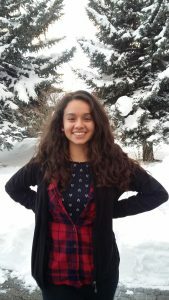 “It’s nice to get away from home but not be too far that I can’t go home if I need to.” She also credits Earn to Learn and NAU’s 1st Scholars program with providing the support that she needed for things to go smoothly. When Isabel is not going to class or completing assignments for her dental hygiene program prerequisites, she is getting more involved with life at NAU and in Flagstaff. “I joined the dental club on campus to learn more about the field. I also joined a soccer team through my church and volunteer at the Humane Society as part of the 1st Scholars program.” Getting more involved has proven to be a big part of making the most out of her new life and setting herself up for success.